The beauty in diving is that you never know what can appear suddenly... I took the picture thinking it was a blacktip shark. When I got the slides back from the lab, I noticed the markings were different. After some research, I realised it was a spinner shark. 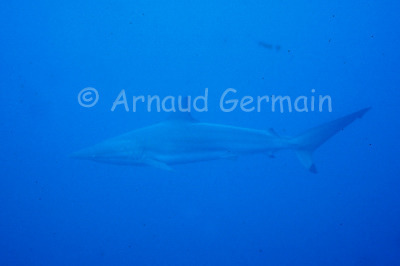 This species often associates with blacktips (as was the case on the day I took the picture). There was a group of about 12 sharks swimming around us as we were doing our decompression stop near the surface.